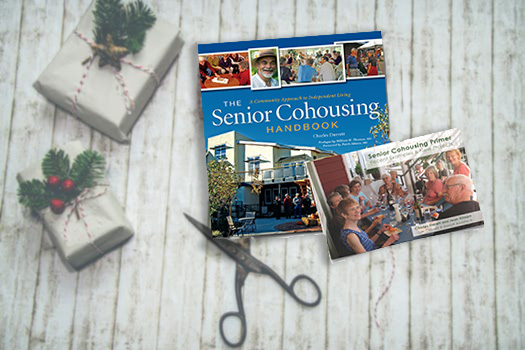 Give the Gift of Cohousing for the Holidays! Look no further for your gift giving this holiday season! The Senior Cohousing Handbook: A Community Approach to Independent Living is a classic cohousing book and is used worldwide as a guide to getting senior cohousing projects started and sustaining them for decades to come. Senior Cohousing Primer: Recent Examples and New Projects is a perfect companion to The Handbook, giving folks an easy to understand look at the senior cohousing movement today. Together, these books are the first step to getting a senior cohousing project started in your area. For a limited time, MDA will gift wrap the books for you, signed by Chuck Durrett, and drop ship them to your loved one’s upon request! This offer extends through Dec 17 and is valid in the U.S. only. Please contact Holly at MDA.admin@cohousingco.com to place your order if you live outside of the U.S.
Cohousing is an emerging lifestyle that offers quality of life options not readily accessible from conventional urban sprawl and high density living concepts, says the architect who introduced the concept to North America. Charles Durrett says the lives that Millennials’ parents and grandparents aspired to, such as living in a single family home, has become less realistic looking forward with the cost of housing and detrimental environmental impact of urban growth. “I think you are beginning to see a cultural shift in how people want to live their lives. More and more people today are willing to look outside the box on how to make something work that will impact their lives in a positive way,” he said.